The new Proform Cardio HIIT Elliptical Trainer provides a unique elliptical that burns more calories and works out more muscles. Its compact base takes up less room than traditional ellipticals. HIIT stands for High Intensity Interval Training. The HIIT works by your giving 100% effort for a set time, with short recovery periods. This workout will keep up your heart rate, burn calories and build strength. You get a full body workout as well, with a 10-inch vertical elliptical stepping path along with upper body punching actions which will simulate stair climbing and boxing. This action exercises your calves, hamstrings, glutes, quads, biceps, and triceps. As your feet never leave the pedals, you achieve near zero impact which is easy on your joints and back. The HIIT Trainer has SMR Silent magnetic resistance: Has the advantage of no friction, reliability, little to no maintenance costs, and quiet operation. The HIIT Trainer has a 28 lb. flywheel for smooth operation. 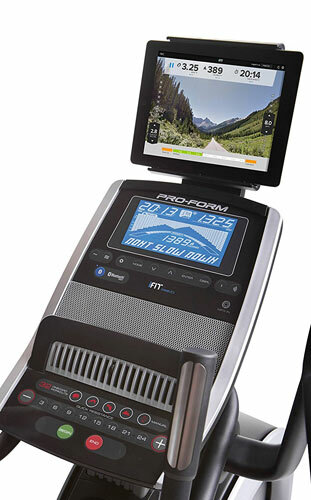 Proform HIIT Elliptical Features: The 7-inch backlit LCD screen shows your progress with 32 workout apps, and 24 Resistance levels. 5-inch elliptical stepping path with 10-inch vertical. Transport wheels to move your Elliptical Trainer. Grip heart rate monitoring on handlebars provides your cardio progress on the LCD screen. Integrated tablet holder (does not block console display). Cool Air workout fan, water bottle holder, Audio auxillary port with 2 speakers. Compatible with Bluetooth smart heart rate monitors. iFit® Coach Ready™ (iFit subscription required). Bluetooth connectivity and iFit allows personalized workouts, customized calorie targets, activity recommendations, daily coaching. Work out all over the world with Google Maps™. 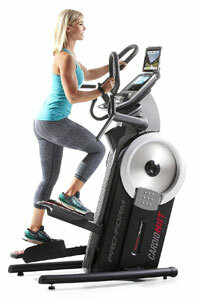 Smart-Review Commentary: The Proform Cardio HIIT Elliptical Trainer is a unique exercise machine. It is built for high intensity workouts, simulating a stair stepper and boxing at the same time. It is a low impact workout, and a smooth ride with the 28 lb. flywheel and Magnetic resistance. It can burn more calories than traditional exercise equipment such as treadmills. A solid machine with a maximum weight limit of 350 pounds. HIIT is high intensity, so check with your doctor about this type of exercise. Stride is 10″ Vertical, 5″ Horizontal. As for features, this one is fully loaded with 32 workout apps, 24 levels of resistance, speakers and workout fan. For Home Elliptical Trainers, the Proform Cardio HIIT is a Smart-Review Top Pick for 2019.